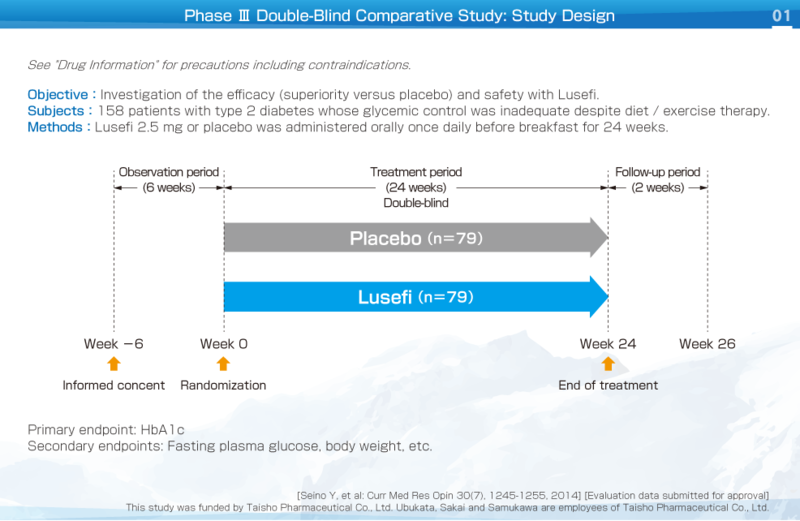 This was a placebo-controlled, randomized, phase Ⅲ double-blind, comparative study (parallel-group comparison) that investigated the efficacy and safety of Lusefi in patients with type 2 diabetes whose glycemic control was inadequate despite diet / exercise therapy. 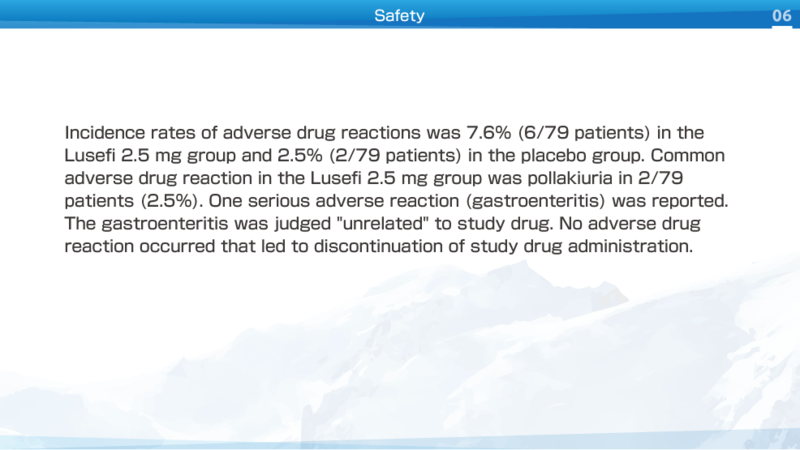 Lusefi 2.5 mg or placebo was administered orally once daily before breakfast for 24 weeks. 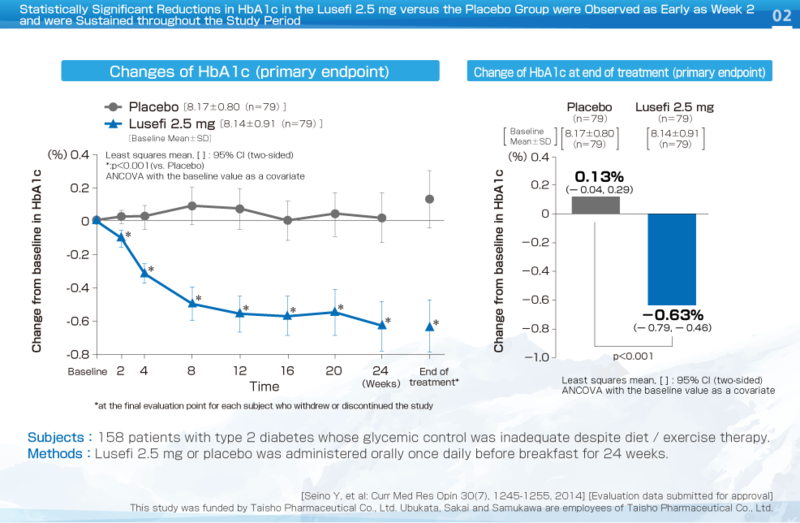 Statistically significant reductions in HbA1c in the Lusefi 2.5 mg versus the placebo group were observed as early as Week 2 and were sustained throughout the study period. The LS mean of the change in HbA1c from baseline to end of treatment was -0.63% and 0.13% in the Lusefi and placebo groups, respectively. 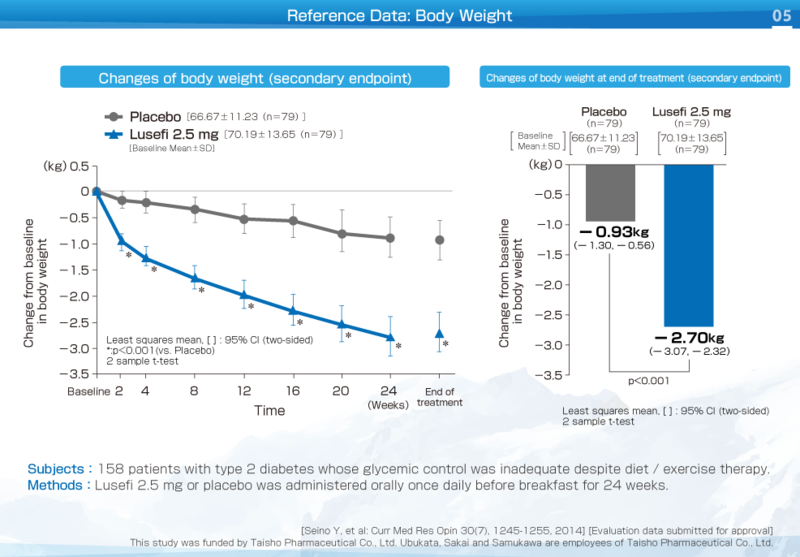 Statistically significant reductions in fasting plasma glucose in the Lusefi 2.5 mg versus the placebo group were observed as early as Week 2 and were sustained throughout the study period. 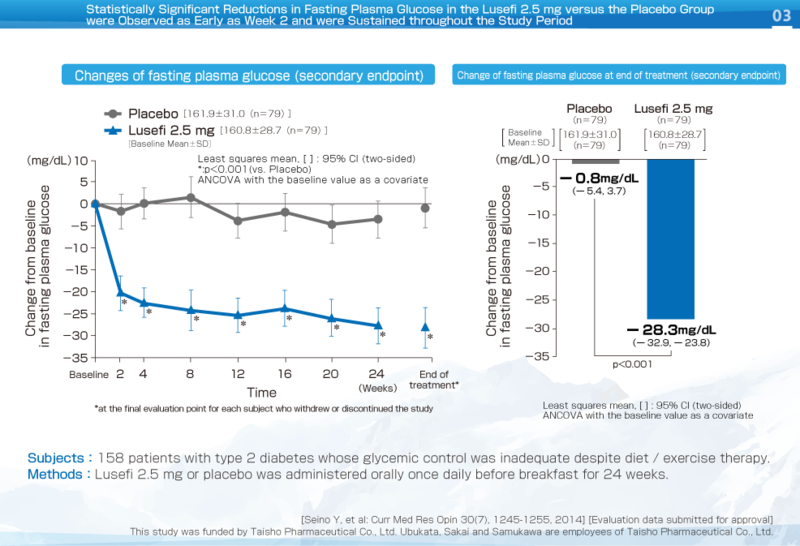 The LS mean of the change in fasting plasma glucose from baseline to end of treatment was -28.3 mg/dL and -0.8 mg/dL in the Lusefi and placebo groups, respectively. 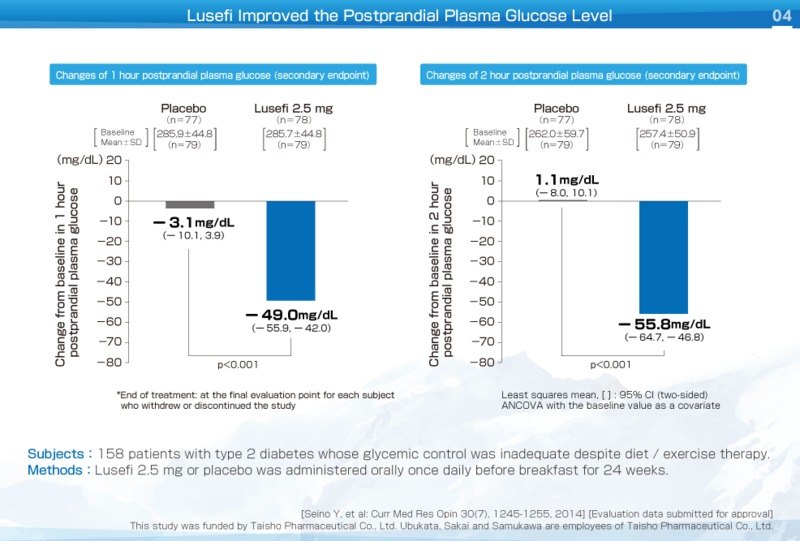 The change of 2 hour postprandial plasma glucose at end of treatment was -55.8 mg/dL in the Lusefi 2.5 mg group, while it was 1.1 mg/dL in the placebo group, with a significant difference being recognized. Statistically significant reductions in body weight in the Lusefi 2.5 mg versus the placebo group were observed as early as Week 2 and were sustained throughout the study period. 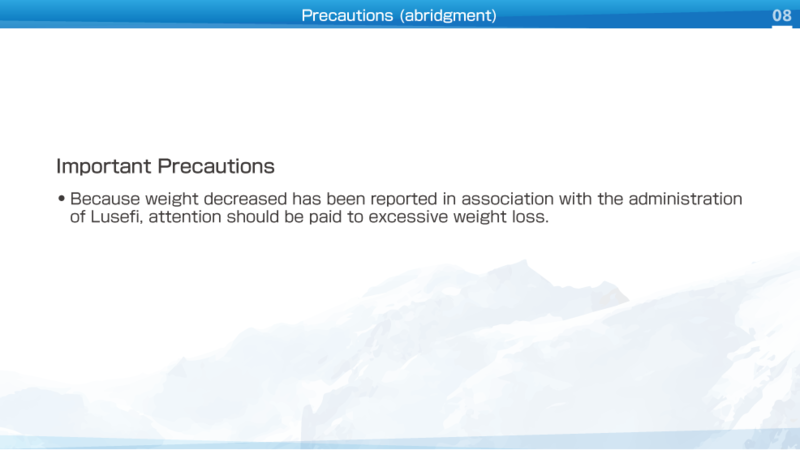 The LS mean of the change in HbA1c from baseline to end of treatment was -2.70 kg and -0.93 kg in the Lusefi and placebo groups, respectively. 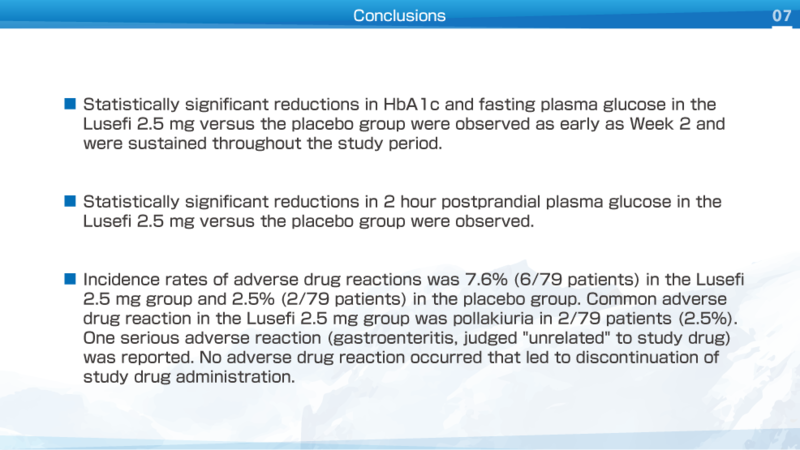 Statistically significant reductions in HbA1c and fasting plasma glucose in the Lusefi 2.5 mg versus the placebo group were observed as early as Week 2 and statistically significant reductions in 2 hour postprandial plasma glucose were observed. In addition to, statistically significant reductions in body weight in the Lusefi 2.5 mg versus the placebo group were observed as early as Week 2.